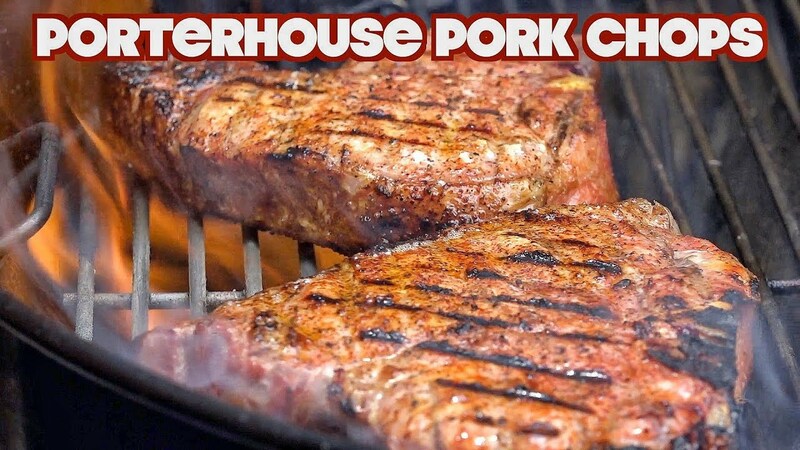 Porterhouse Grilled Pork Chops combine both the tenderloin and the loin. In this video I teach you how taking them to an internal temperature of 145 with a 3 minute rest will get you a juicy chop. Then to take the flavor to another level I will teach you a simple Dijon cream sauce. Set up your grill for two zone cooking and let it heat up to around 275 to 300 degrees. Lightly season one side of the pork chops with salt, pepper, and The Rub. Add a strip of hickory on top of the coals, then place the pork chops, seasoned side down, over indirect heat and season the other side with more salt, pepper, and rub. Cook low and slow until they reach an internal temperature of 135 degrees, rotating part way through for even cooking. When you reach 135 degrees, move the pork chops to direct heat to finish them off. Flip regularly to make sure they develop a crust, but don’t burn. Remove from heat at 145 degrees and let rest for three minutes. While the chops rest, make the sauce by adding melted butter and shallots to a stainless steel or other “sticky” pan and place on the grill over heat. Cook for about 2 minutes, until shallots are soft, then add wine and bring to a boil. Add chicken stock and reduce by one third. Add cream and reduce by half. Move the pan to the cool side of the grill, add Dijon mustard and parsley, and whisk thoroughly. Sprinkle in some of The Rub and whisk again to combine. Drizzle sauce over the pork chops to serve. Check out the whole process below!